The regulated and insured Gibraltar Blockchain Exchange (GBX), today announced its intention to list five key stablecoins on to the trusted, Digital Asset Exchange (GBX-DAX). The trading of PAX, DAI, USDC, GUSD and TUSD will go live on Wednesday the 13th of March. 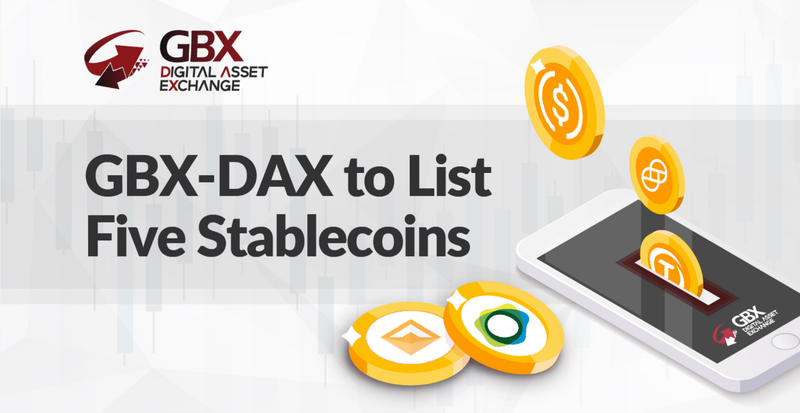 In the build-up to the stablecoins going live for trading, the option to deposit stablecoins in your GBX-DAX account is now available. Users will be able to deposit any of the five listed stablecoins in preparation for trading on Wednesday. To celebrate the listing of these top-tier stablecoins, the GBX will be giving all users 30 days fee-free trading for all stablecoins on the DAX. The fee-free trading period will begin in conjunction with live trading, starting on Wednesday the 13th of March and concluding on Thursday the 11th of April. The PAX is a USD backed stablecoin, combining the stability of fiat currency with the reliability and cost-effective speed of blockchain technology. PAX is redeemable one-to-one with USD, meaning 1 PAX will always equal $1 USD. DAI is a digital asset-backed, stablecoin, pegged to USD and one of the first decentralized stablecoins on the Ethereum blockchain. A collaborative effort by Circle and Coinbase, developed by the CENTRE consortium, USD Coin (USDC) is an Ethereum based stablecoin, backed by USD fiat currency, and redeemable on a 1:1 basis, creating stability behind the digital asset. The Gemini Dollar (GUSD) created by Gemini, is a USD fiat currency backed stablecoin. The GUSD is a regulated stablecoin under the oversight of U.S regulators and redeemed on a 1:1 basis with the US Dollar, which can be used on the ethereum network. The TrueUSD (TUSD) is the first stablecoin by TrustToken. TUSD is an ERC-20 token, backed by the USD fiat currency. It is fully collateralised and verified by third-party confirmations. The listing of stablecoins supports the aims of GBX and the wider GSX Group, to bring about a new era of blockchain powered finance. To register for a free account, and begin trading stablecoins, with 30 days fee free trading, visit our registration page here, and see the many benefits of joining the GBX community.